Hi friends! I hope you are having a great day! We are doing ok. We are getting excited for Christmas and Brady's winter break. There's still lots to do. I need to get my rear in gear but I'm so tired from all these illnesses! Here's a project I made for the May Arts Deck the Halls With Burlap Challenge. 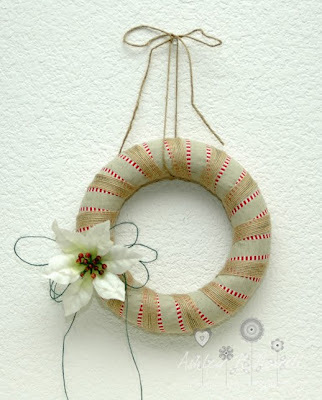 They put out a call on the May Arts Blog for people who wanted to make a project with their fabulous ribbon and burlap to make a Christmas project. I decided to make a wreath with the ribbons they sent me and I think it turned out very pretty. The only things that aren't from the ribbon collection are the small wreath form and the flower. I love how earthy this turned out! I love burlap; heart this!